If you have a Gordmans store in your area, the Rogue One AT-ACT has been marked down to $49.99. So if you’ve held off on getting this, or looking for a fun Christmas present at a good price, you may want to pick this up if you are able to. Personal Note: If Hasbro had not over-engineered this thing with the app, walking feature, Nerf, etc… and had instead made it more on par with THIS, it would have performed much better for retailers. What say you? 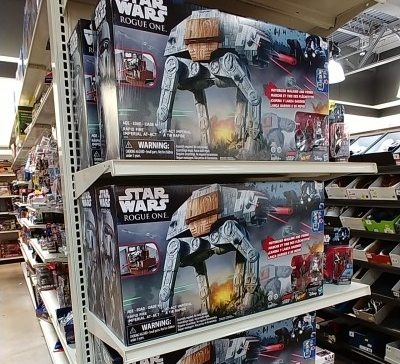 While out and about today, I swung by my local Gordmans store (thanks to a tip from St. Louis area collector Darth Stringfield) – and saw a huge amount of AT-ACT’s for $70.00 each (and a handful of basic Rogue One figures for $2.99 each). Personal Note: Even if you didn’t care for the way Hasbro engineered this walker, for this price, I don’t feel you can go wrong. Even if one gets it just for a shelf display, it’s still really cool. You can also check to see if you have a Gordmans within reasonable driving distance from you on their store locator. Hasbro’s Naboo Starfighter is one of their better efforts recently, but unfortunately we all know how hard it’s been to track one down due to the overload of Podracers and AAT Tanks in the first assortment of 2012’s Movie Heroes line. But, even as abysmal as retail has been over the past year for Star Wars merchandise the market actually wants, there’s still hope to find this particular ship if you have a Tuesday Morning or a Gordman’s store in your area. The Naboo Starfighter has been sporadically showing up at these two discount chains in recent weeks – including a recent score by forum member Grimace. Click on the thumbnail above for a closer look and keep those store reports coming in!